This is such a classic recipe that I had to come up with a low carb, keto, grain-free, gluten-free, sugar-free, Trim Healthy Mama version. Chocolate cake plus cheesecake plus chocolate chunks. Need I say more? Black Bottom Cupcakes. For some reason, black bottom cupcakes always remind me of Starbucks. When I was in college they were a staple in the baked goods display. I may have indulged in one. Once. Or twice. Or… I probably shouldn’t go there. Back to the present day. And my waistline after four children. Now I need a healthier version than the standard high carb sugar filled black bottom cupcakes. This is low carb, sugar-free, grain-free, gluten-free, and a THM S recipe. If you are new to my blog you will see that many of my recipes use two special ingredients. I’ve created my own baking mix and my own blend of sweetener. Both only use three ingredients each. It makes baking much easier to have these mixed up and waiting in the pantry. You can just dump all the chocolate cake ingredients into the bowl at once and mix with an electric mixer. It will end up like a thick chocolate batter. Divide the batter into 12 paper lined muffin tins. Use a spoon to make a well in the center. That is where the cheesecake will go. In a new bowl (or after you wash the first one) mix 4 oz cream cheese, 1 egg, 1/2 tsp vanilla, 1 tsp butter, and 2 T sweetener. Blend until smooth. 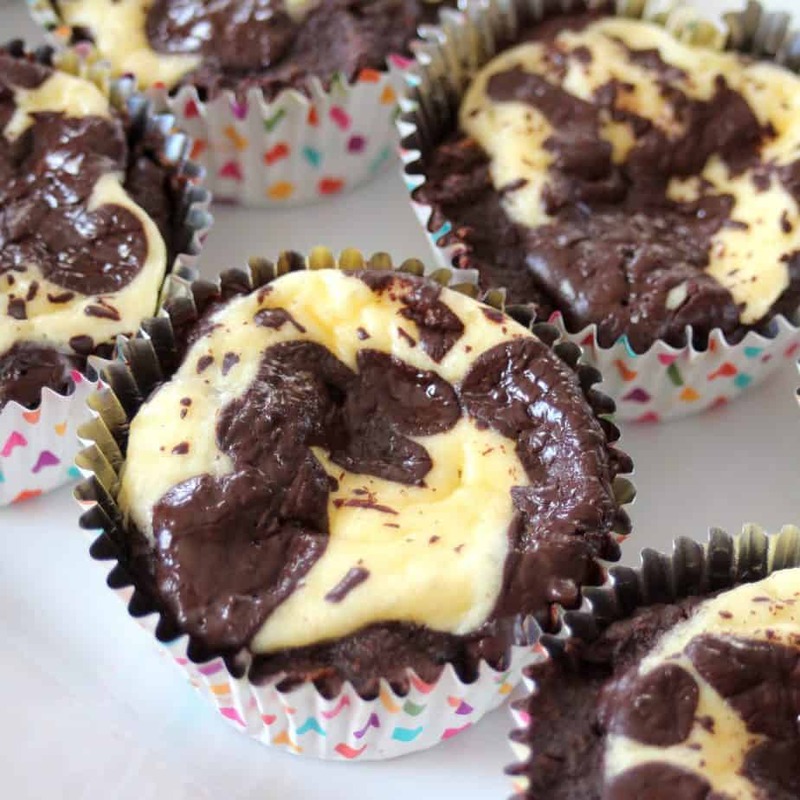 Divide the cheesecake batter between the cupcakes. Sprinkle the tops of the cupcake with the chopped chocolate. Bake at 350 for 22-25 minutes until the cheesecake is slightly firm, puffed up, and turning golden brown around the edges. Cool for at least 15 minutes before serving. Store in the refrigerator. I think a 9x9 square pan would work best. It would be thinner in a 9x13. I have made these and they are UH-MAZING! Can they be frozen once baked? I think I might have eaten too many trying to eat them all before they spoiled! This is my "GO TO" chocolate treat. Last week was my husbands birthday. His favorite cake is German chocolate with the yummy coconut pecan frosting. I love it too except that I have a mild allergy to pecans that seems to be getting worse as I get older. Anyway, I made his cake. While I was frosting it, I realized that I needed a PLAN or I was going to eat this OFF PLAN cake. Black Bottom Cupcakes to the rescue. But, OH NO!!!!!! I didn't have any cream cheese or time to go get some. That got me thinking about how I could make a German chocolate version. I was planning on making the Almond Joy cookie recipe that you shared from My Montana Kitchen, so I had all those ingredients. So I made the cookie dough and scooped 1 Tablespoon of the cookie batter onto the top of this black bottom recipe, in place of the cream cheese mixture, and BOOM! German Chocolate black bottom cupcakes. They are delicious and kept me on plan all weekend. Thank you for such a wonderful recipe that lends itself well to some substitutions. I will be making a batch of both versions when I meal prep for the week because, you know, A GIRL HAS GOT TO HAVE CHOICES!!!!! Thanks for all of the wonderful recipes, Taryn! Does baking soda or baking powder work with the baking blend to make pastries fluffier? Hi, do you have the nutrition information on these? I am counting carbs ;-) Thanks! I just added it to the bottom of the post. Thank you for this recipe! :) My husband declared it his favorite THM recipe yet. Since finding it on the THM Facebook Group the week before last I've made 4 different batches (2 of those were doubled). :) We made them for a family reunion and they were devoured. I've got another batch baking now (as brownies) for another family get together. This was the first recipe I've made off your site, but I'm sure I'll be making a lot more of your recipes as this was such a hit! p.s. I like these even better as brownies. Less work and the same great taste. The batter did beautifully in my 8x8 pan. Now I'm going to double and bake it in an 11x17 to use up my canned pumpkin. Unsweetened applesauce would be best. But one reader said she did 2 tbsp coconut oil plus water to equal 1/2 cup. Yes, it should be a 1:1 conversion. Is there anything that can sub for the pumpkin puree? Hi Patti, you can sub applesauce or 2T of coconut oil plus water to equal 1/2 cup. I've had readers use both successfully. If all I have is the THM baking blend, do you use the same measurements? This looks amazing and I want to make it ASAP but only have that baking blend. Yes, you can use the same amount. thanks I can see it now! going to try these today? looks great! is there a printable version of this recipe? I LOVE that your recipe includes the ability to decrease and increase serving sizes. I will defintely be trying these .